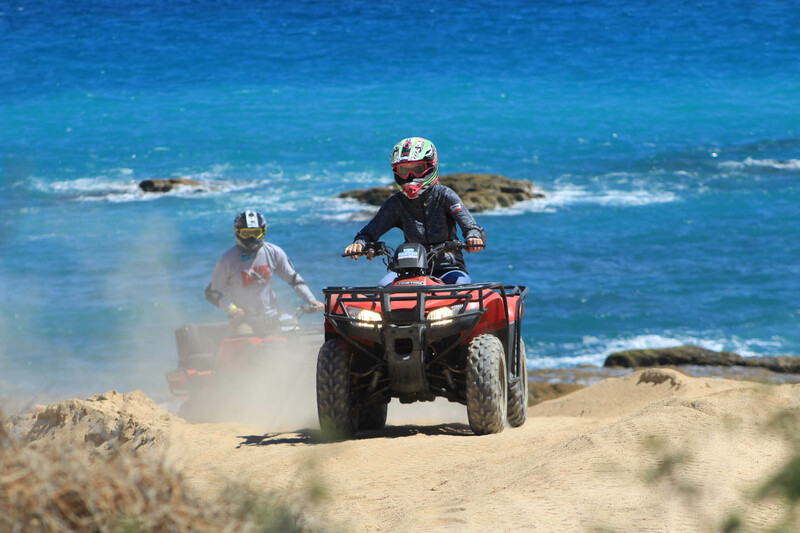 Best ATV Tour in Los Cabos! ATV Tour in Los Cabos: Come and venture among landscapes that only Baja California and Los Cabos can offer! Baja is known for its stunning paths snaking through the desert and challenging pilots as they explore the beauty of this rugged environment. Our Off-Road Runners tour is ATVs deluxe. To get started, we’ll equip you with our top brand protection gear including goggles and a full-face helmet. Then we’ll give you the keys so that you can get a feel for your one or two-passenger ATV. Our professional guide will make sure you have an unforgettable tour! We will take you on routes that are appropriate for your driving skills and preferences which always include our desert and beach. To ensure you have fun and to address any possible doubts you may have, we take you on a test ride within our practice circuit. This way, you will become familiar with the vehicle and the terrain. Once your training ride is concluded, and all your comfortable and ready, you’ll start your tour comprised of 5 different areas within the 100 hectares covered by our park: ocean, dry riverbed, beach, canyon, and mountain. Lastly cross our famous 330 meter long suspension bridge. The only pedestrian and vehicle hanging wooden bridge in Los Cabos! Los Cabos Canyon Bridge is 1,082.67 feet long, 6.56 feet wide and 164.04 feet above the ground at its lowest point. By experiencing these five different types of terrain, you’ll get a good idea of what Baja off-roading is all about. And to top off the tour with even more fun, we invite you to get cleaned off from all the dirt using an air compressor, this way you can leave the park comfortably. Are you ready to meet the vast desert and the beautiful beaches of the Sea of Cortez? Our professional guides will make sure you have an unforgettable tour by taking you on routes that are appropriate for your driving skills and preferences that always include desert land and beachfront. Do not worry about getting all dusty! At the end of the tour we will have fun removing all the dirt and dust with an air compressor so you can feel more comfortable. And to top your time off with us, we invite you to relax in our The Lion’s Den restaurant. Note: The ATV Insurance is NOT included in the price of the tour, but is mandatory. You can add the insurance on this website or pay it directly at the park. The pilot must present a valid driver’s license. ⁽¹⁾Driver Minimum age: 16 years with drivers permit and must be accompanied by an adult.